Facebook has disbanded its Home (Android Launcher) team, but the app still lives. Facebook's plan to take over the smartphone has not panned out and the social networking site has disbanded its team that was initially responsible for developing Facebook Home. The Android skin released last year displayed Facebook photos on its lock screen and provided easy access to chat messages and status updates. The Home app released last year wasn't a success that Facebook had hoped for. Although it did a good job of transforming an Android phone into one that felt purpose-built for Facebook, not many users took it up. The skin came preinstalled on the HTC first, but did not get a good response and disappeared shortly after its launch. Facebook Home saw half a million downloads after its launch, but the growth stalled from there. Google Play lists that the skin has been installed between 1 million and 5 million times which is quiet low for Facebook. Facebook says that it still has a team working on Home, but chances of it moving forward are less. The app remains available in the Play Store, however it hasn't been updated since January. 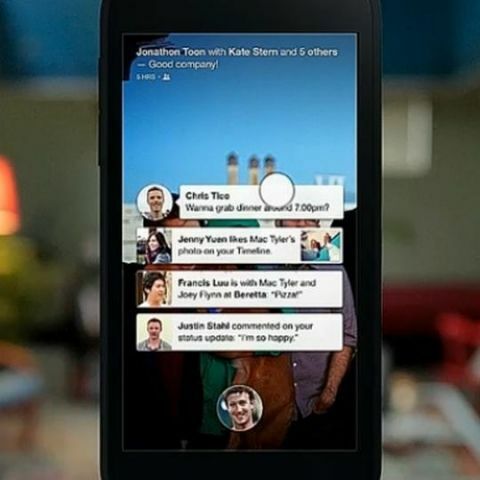 Facebook has been working on new apps like Slingshot and Facebook Paper. Paper is a magazine-style news reader service and was launched in February. The service is very similar to Flipboard and Google Currents and pulls out relevant content including photos, videos and links from Facebook feed. Facebook launched a Snapchat clone called Slingshot earlier this month. The app allows users to share videos and photos with their friends, but the only way recipients will be able to see the messages will be if they share something back on Slingshot. The app has been officially launched for Android and iOS platforms.